An enjoyable circular walk of some 7 miles, mostly flat, across open countryside , through farmland with some 5 stiles (mostly dog friendly). 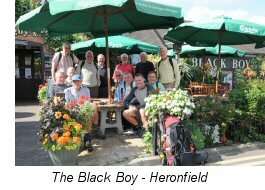 The walk starts at Heronfield, south of Knowle. 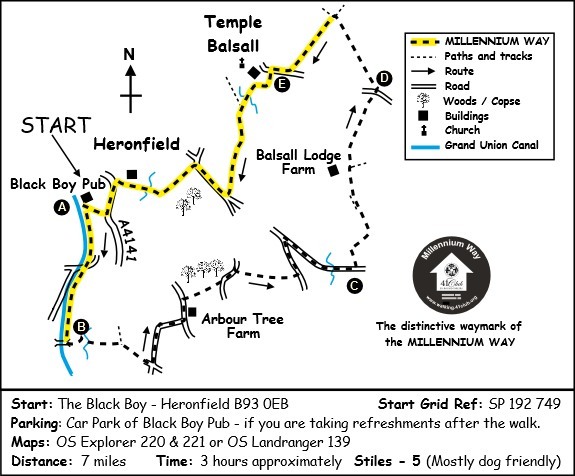 The MILLENNIUM WAY section is clearly waymarked with the distinctive black and white circular waymarkers. Find out more about the walk by clicking on the information icon. 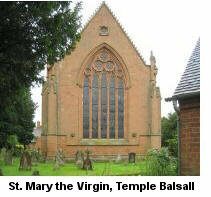 During the early part of the walk, you will follow a short section of the Millennium Way along the Grand Union Canal and after walking some delightful open countryside will rejoin it at Temple Balsall (Point E), here you may wish to take a short detour to visit the church of St Mary at Temple Balsall which has connections with the Knights Templar. We start our walk from The Black Boy public house. From the left hand car park (left of pub, bridge & recycling bins) take gap to canal towpath and go left along canal side following the distinctive black Millennium Way waymarker. Continue under bridge 68 and when you reach bridge 67 go left, to take kissing gate to field. (Here we leave the Millennium Way for the time being). Go ahead into field keeping hedge left to cross footbridge over stream. Continue across next field between fences towards pylon, then pass under power lines to take metal kissing gate ahead and continue along wide grassy path which soon becomes a farm track. Keep ahead to take metal kissing gate to lane. Go left on road (Arbour Tree Lane) and stay on lane which bends sharply right by Netherwood Lodge Farm to reach the main Warwick Road. Go left on main road past Arbour Tree Farm then take waymarked path right, just on the bend. After passing through the two gates stay ahead keeping hedge right. Where the hedge ends continue along keeping metal railings on your right, soon to take stile on right into next field. Go left along edge of field keeping hedge left then cross corner stiles to lane and go left for 100 paces to take kissing gate right and continue along between fence and hedge. Take the next kissing gate, then ahead with fence and hedge right. Take waymarked metal gate into next field then over stile and continue ahead with hedge right. Exit field by metal gate and go left along lane to pass Chadwick Barns on left and when you reach the junction turn right and continue down lane. Cross the ford and continue gently up the lane to find public footpath by two metal kissing gates on left. Take both kissing gates, and go ahead into field then ahead with hedge and fence right to take metal kissing gate and footbridge in corner of field. Continue right with hedge right walking gently uphill. At top corner of field ignore kissing gate right and go left, continuing down field with hedge right. (You have now joined The Heart of England Way). Soon you will bear slightly right through corner copse then go gently downhill with hedge left until you reach hedge corner. Go ahead across field, over ditch then continue uphill across the middle of next field. On reaching the waymarker post go directly ahead to reach surfaced track and continue with hedge right until you reach the road. Go right on road and a few paces past Barracks Cottage go immediately left along signposted path to continue along The Heart of England Way. 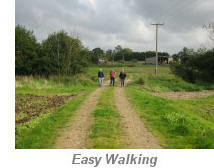 Go along narrow path with ditch right and fence left to emerge into large field, continuing ahead with hedge right. Stay ahead through next gap and go with hedge right towards pylons in far distance. Take boarded gap into next field to eventually reach crossroads of paths (here we rejoin The Millennium Way) where we turn left, staying in the same field, continuing along with hedge right for just under 1/2 mile to reach road. Turn right down road and after approx 100 paces turn left down lane then through metal gate and down farm track. Follow farm track around to right and just before farmhouse entrance take stile left to go on track parallel to power lines. Cross small stream to next field staying parallel to power lines and follow track into next field as it bears left (here you will be guided by the black Millennium Way waymarker). Go with hedge left to kissing gate at end of fields to reach road. Turn right on road for a short distance to junction, then go right on Chadwick Lane and on reaching house with large pond turn left on path to right of driveway. This leads to an enclosed track which at times can be muddy. However, you will find a couple of elevated walkways on your left which can now be used to bypass some of the muddy areas. Continue on to reach a farm track then turn right. Go under power lines and where the track turns right go ahead through gate and follow path past The Dial House to main road. At the road turn left and after some 250 paces take driveway right back to The Black Boy Inn. 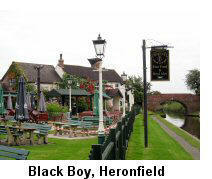 Pubs across England called The Black Boy are generally named after King Charles II. It was a nickname coined by his mother because of the darkness of his skin and eyes. The original Black Boy was closer to the Warwick Road than the building that stands today, the new premises were built in 1793 because of the new canal trade. 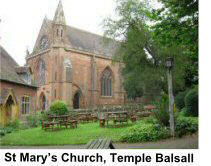 Although off the Millenium Way, the buildings at Temple Balsall should be visited. The complex of almhouses, church and the Old Hall present a fascinating story. 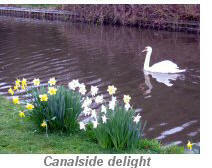 The area belonged to the Knights Templar brotherhood from the 12th century and they farmed around 620 acres. After the order was suppressed, the land was given to The Knights Hospitaller of St. John. It was again lost when Henry VIII dissolved the monasteries, and Queen Elizabeth I gave the estate to Robert Dudley (see Circular walk - Kenilworth for more on Dudley and Elizabeth). Robert Dudley's grand-daughter, Lady Katharine Leveson of Trentham Hall, Staffordshire, inherited the estate. On her death in 1674, Lady Leveson left endowments for almshouses, the Lady Katharine Leveson primary school and the local church. The 13th century church and Old Hall and 17th century almshouses survive. The Old Hall, adjacent to the Church, headquarters of the Knights Templar, dates from the 13th Century. Though partly converted into a cottage, and with its original walls encased in brick, it is one of a very small number of medieval aisled halls, which survive. The cellar of the Old Hall was excavated in 1981 and was found to contain a great deal of late 17th and early 18th century pottery and glass. The items found are on display in the Old Hall.